Flor Loya-Costabile, DDS is a bilingual pediatric dentist committed to helping educate her patients and their parents in the prevention of cavities while at the same time alleviating the anxiety (and sometimes fear!) that often accompanies a visit to the dentist. Singing and actively engaging the children are part of Dr. Loya-Costabile’s unique way of making each dental visit fun – not something to avoid. No less than the Surgeon General has termed cavities the number one infectious disease among U.S. children. Regular preventative care and strong oral hygiene are the keys to changing this unfortunate statistic. We are a MINIMAL SEDATION office. We offer Nitrous oxide (laughing gas) to only the most anxious of patients and those that are in need of oral surgery. Dr. Loya-Costabile takes great pride in being able to work with most children in a non-pharmacological (without drugs) manner. Our goal is to work with your child through a trusting, long-term relationship fostered using one on one communication. Your child is our number one priority: we want him/her to be comfortable and relaxed for all dental appointments, so Dr. Loya-Costabile will discuss options making sure that your child receives the best treatment for him/her. In those rare cases where for medical or other reasons it is in your child’s best interest to be treated “asleep” we will discuss treatment options at an affiliated hospital or other appropriately equipped facility. Dr. Loya-Costabile grew up in Elmhurst, Illinois where she attended Jefferson Elementary, Sandburg Middle School and York High School. She earned a Bachelor of Arts in Biology from The University of Chicago and went on to the University of Michigan Dental School where she received her dental degree in 1990. In 1991, she completed a General Practice Residency with an emphasis in Pediatric Medicine & Dentistry from the University of Chicago Hospitals and Clinics. In 1993, she completed her Residency in Pediatric Dentistry from the University of Illinois Chicago. From 1993 to 2002, Dr. Loya-Costabile was a Clinical Assistant Professor at Loyola University Hospital while teaching at the Oral Health Center and having hospital privileges. She has also been previously affiliated to Westlake Community Hospital. Dr. Loya-Costabile is a Diplomate of the American Board of Pediatric Dentistry. Upon completion of specialty training, Pediatric dentists may voluntarily seek to certify their professional excellence through an evaluation and critique of their abilities by their colleagues. After validation of credentials, pediatric dentist candidates are eligible to initiate the certifying process administered by the American Board of Pediatric Dentistry (ABPD). The ABPD Board of Directors are elected by the membership of the American Academy of Pediatric Dentistry. This rigorous multi-part examination is voluntary and is for the purpose of validating the candidates’ advanced training and their clinical and diagnostic abilities. Mastering this voluntary examination honors one with the highest level of validation and expertise in the specialty, and he/she is designated a Diplomate of the ABPD, becoming a member of the college of Diplomates. Only a limited number of pediatric dentists in the world have been honored in this way. As a result, it is considered the “Gold Standard” within the specialty. 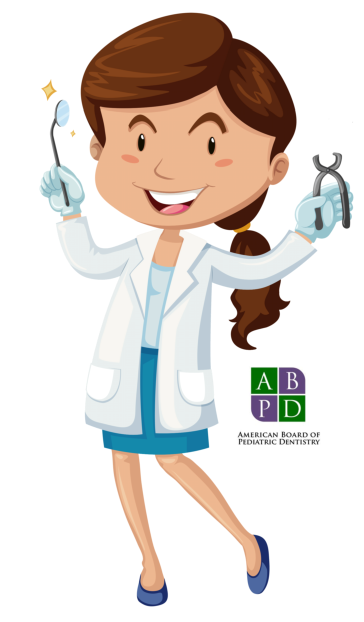 Dr. Loya-Costabile is very proud to be a Diplomate of The American Board of Pediatric Dentistry. Dr. Loya-Costabile’s personal interest lie in the areas of her family, including her husband David and their two active children, Gabriela and Daniel. In addition to her focus on her own family, she is dedicated to helping other families that are less fortunate, and she has regularly volunteered her time conducting free patient care and education to under-served patient populations in the Chicago land area as well as abroad. Her professional goal is to be actively involved in pediatric dentistry and to provide the highest quality of care to her patients. Our team consists of passionate individuals who are kind, friendly and caring. They strive to ensure a pleasant experience during your child’s visits to our office. Our experienced and energetic team members’ goal is to communicate well with both you and your child to provide the best care possible. Dr. Loya-Costabile truly believes her greatest asset in treating children is not her office or advanced dental equipment. Without a doubt, the most important aspect of her office is her staff—the wonderful group of individuals that have a genuine love for children. Their friendly smile, gentle ways and calm demeanor are responsible for helping our patients have a positive experience every time they visit – turning frowns or fears into smiles.